"It was now quick work," Maria Mitchell noted. "As the last rays of sunlight disappeared, the corona burst out all around the sun, so intensely bright near the sun that the eye could scarcely bear it." 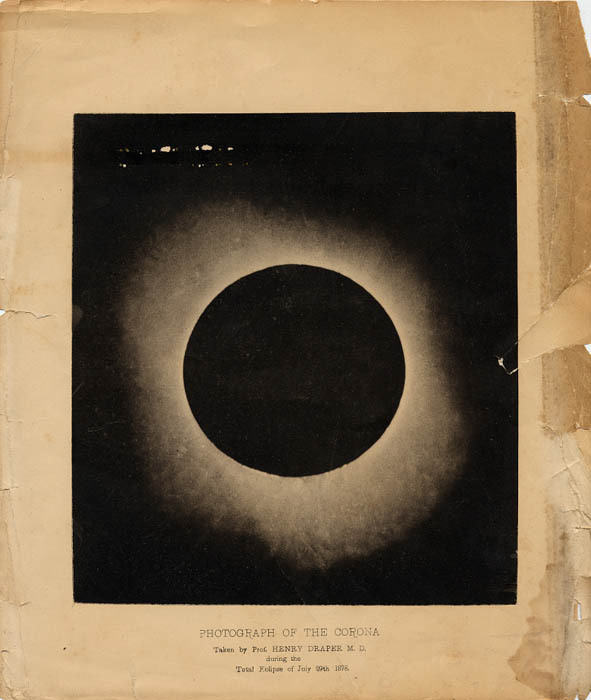 Maria Mitchell brought a team of Vassar graduates—"Vassar girls" as the press called them—2,000 miles to study the July 1878 total eclipse of the sun. When the moon blocked the sun from view, Mitchell recalled, "Each observer at the telescopes gave a furtive glance at the un-sunlike sun, moved the dark eye-piece from the instrument, replaced it by a more powerful white glass, and prepared to see all that could be seen in two minutes forty seconds." Those two minutes and 40 seconds of intense study were the culmination of years of work and struggle. A photograph of the July 1878 eclipse, captured by Professor Henry Draper M.D. Draper Family Collection, Archives Center. By the time of eclipse, Mitchell had spent over a decade training young women astronomers. She was the first professor hired when Vassar College was founded in the 1860s. While women academies had been offering varied curriculums at the elementary and secondary levels to girls fortunate enough to attend, Vassar was one of the first American colleges that aimed to give women an education comparable to the best that was available to men. "It occurred to me, that woman, having received from her Creator the same intellectual constitution as man, has the same right as man to intellectual culture and development," Matthew Vassar declared on February 28, 1861, when he donated $408,000 to start the institution. It isn't hard to see why Vassar wanted Mitchell: a world-renowned astronomer who discovered a comet at age 29. She was the first woman elected to both the American Academy of Arts and Sciences and the American Association for the Advancement of Science. 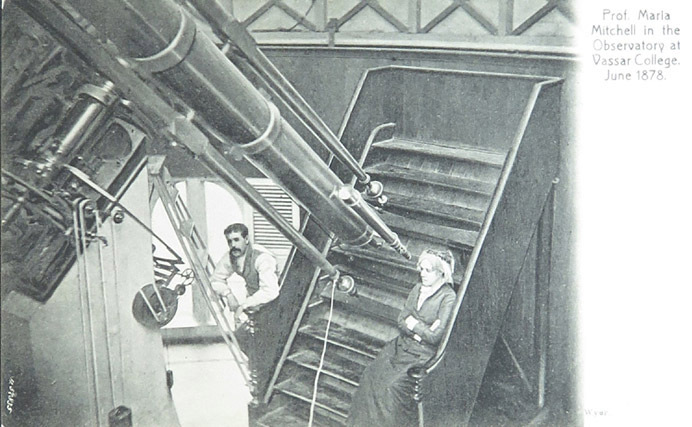 Mitchell sits in front of the telescope in Vassar's observatory in this June 1878 photograph. Mitchell's star status didn't translate into her paycheck. When she was hired, Mitchell was paid $800 a year plus room and board. Male professors were paid $2,000 a year. As time went on, the difference between their salaries grew. In 1870 Mitchell teamed up with fellow professor Alida Avery to request a more equitable salary. Eventually, the college agreed to pay the women the same salary as their male colleagues—but simultaneously began charging the women $16 for "lady privileges." These privileges were basically room and board, but the fee was more expensive than what male professors and guests were charged. When Avery and Mitchell threatened to quit, the college lowered the fee. 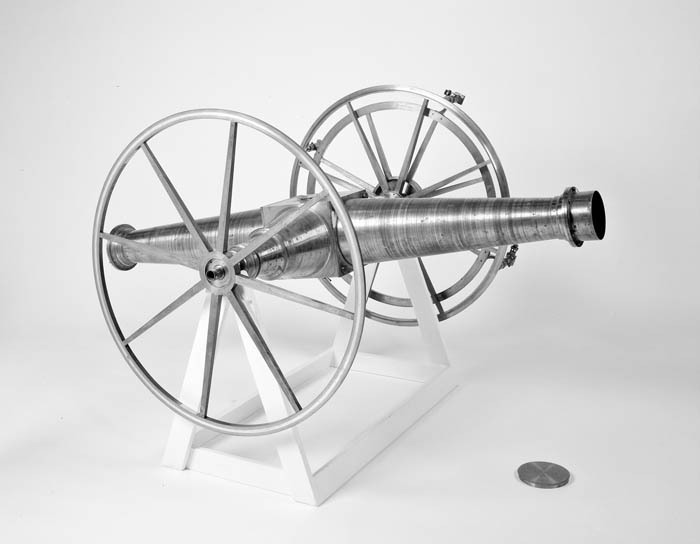 Mitchell and her students used this Meridian Circle telescope. Meridian telescopes allow for high-precision work. Mitchell not only fought for herself, but prepared her students to succeed in a male-dominated field at a time when women did not have equal rights to men—let alone equal respect. "Whatever apology other women may have for loose, ill-finished work, or work not finished at all, you will have none," she told her students. "When you leave Vassar College, you leave it the best educated women in the world." Mitchell would break curfew and hold classes in the middle of the night so students could actively observe astronomical objects. She helped her students publish. In addition to teaching astronomy, she brought guest speakers to discuss politics and women's rights. "If it were only possible to tell you of what Professor Mitchell did for one of her girls!" recalled one student. "It meant so much to come into daily contact with such a woman!" 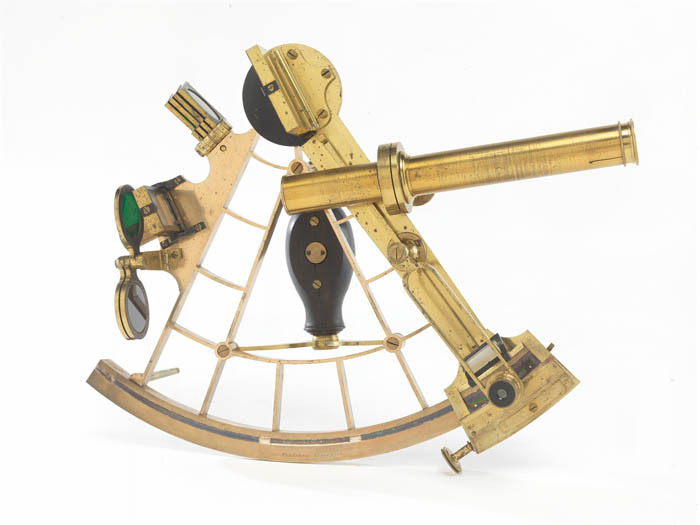 This sextant from Vassar College may have also been used by Maria Mitchell. Sextants can measure the distance between two visible object—often an astronomical object (a star, a moon, etc.) and the horizon. While Mitchell did fight for herself and her students, she didn't fight for everyone. Mitchell subscribed to social Darwinism, a popular belief in the mid-1800s that, in her words: "Poverty is a misfortune; misfortunes are often the result of blamable indiscretion, extravagance, etc." This translated to her work. "If every girl who is aided were a very high order of scholar, scholarship would undoubtedly conquer poverty; but a large part of the aided students are ordinary," Mitchell noted. "I find a helping-hand lifts the girl as crutches do; she learns to like the help which is not self-help." While Mitchell wasn't motivated to educate all women, she was motivated by her students and the science. However, she resented other aspects of her job, particularly fundraising. "It has become a serious question with me whether it is not my duty to beg money for the observatory," she wrote. "What I really long for is a quiet life of scientific speculation." 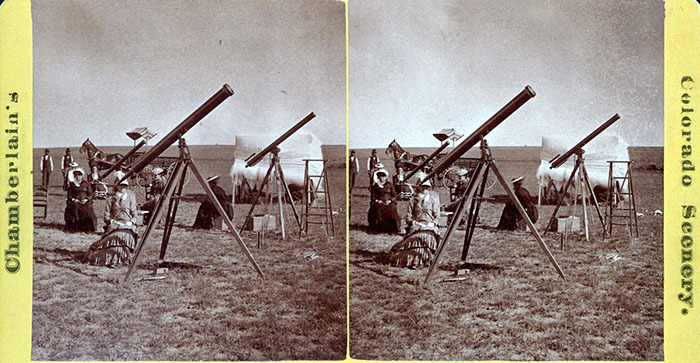 In 1878, after years of teaching and fighting for respect, Mitchell got to embrace that desire for scientific speculation when she brought her team of women astronomers to Colorado to study the eclipse. Maria Mitchell and her students sit, ready to study the 1878 eclipse. Courtesy of Archives & Special Collections, Vassar College Library. Other reports were less misogynistic and more optimistic. The Rocky Mountain News reported "Here in our midst, a conspicuous example of the power and grasp of the feminine intellect has been exhibited." The New York Sun called their success a "pointed arrow in the quiver of woman suffrage argument and logic." Like aspects of the suffrage movement itself, Mitchell's team represented a victory for a certain type of woman: talented, hard-working, and determined, yes—but also buoyed by philanthropic support and societal privilege. While the women may have been observing a total eclipse of the sun, their success was only a partial eclipse of the oppression many other American women faced. Amelia Grabowski is a social media and blog assistant focusing on business and philanthropy history.